One day Medvedik was sitting on his sofa and reading an article on the Greenpeace website about the climate change. When he finished it, he felt a little bit empty. He looked around his room and realized that his room was kind of empty too. No wallpapers, no posters, no pictures. 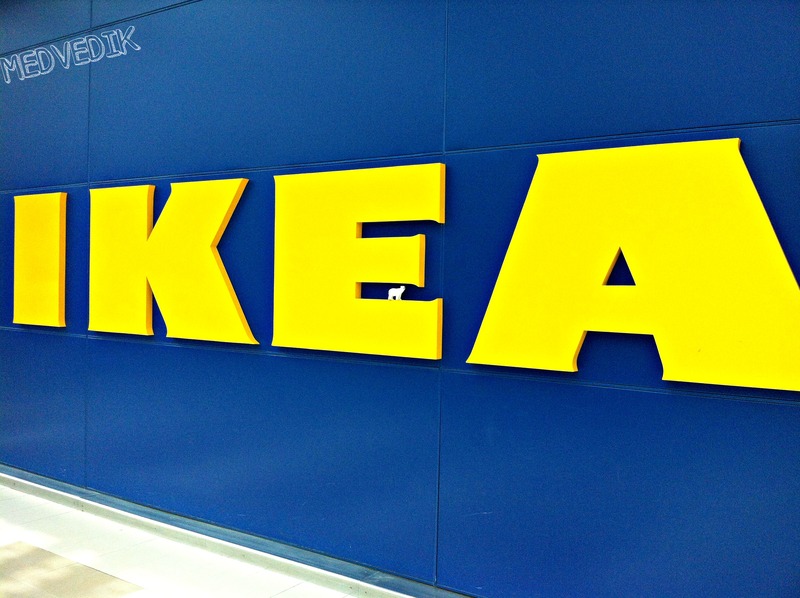 “Boring”, – Medvedik thought, – “I should go and get something nice to hang on the walls” and he went to Ikea. At once the store stroke Medvedik as the huge one, I mean HUGE one, and he felt like a little lost bear in the middle of people, fighting for the trolley. Medvedik realized that he had to be persevering to obtain what he wanted. 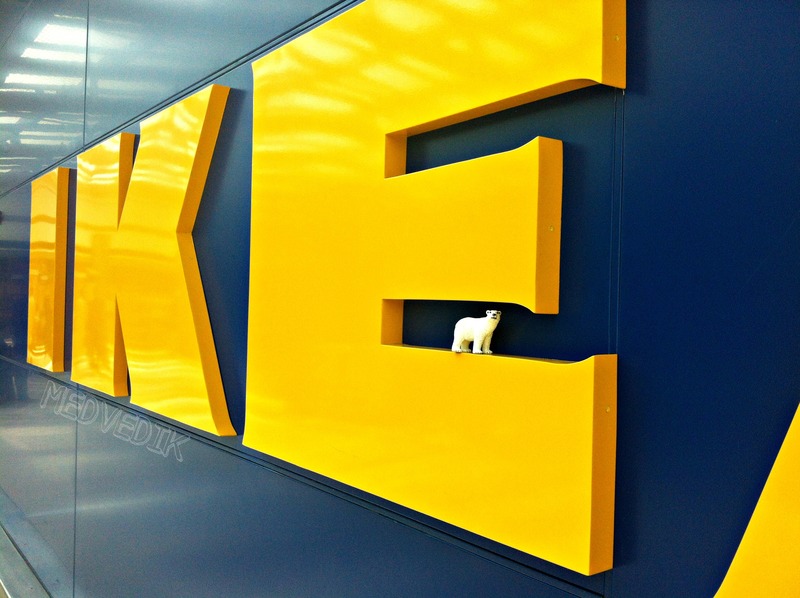 He needed to feel as big as anyone else or he would have drowned in the world of Swedish furniture. He remembered the rule that one of his friends told him to follow in an Ikea store – to be like salmon, to move with the flow. So, he started cruising in the flow of salmon. He liked the smell of the candles, so he put couple of them in the yellow Ikea bag. He got two new knives – to cut his fish and vegetables more efficiently. Medvedik jumped on a couple of mattresses, trying to decide whether the softer one was better, or maybe the harder one was the best choice for a healthy back. He chose a new bed sheet as white as the snow in the North Pole. He was really tempted to buy an armchair, that looked like an old-school chair which you would put next to the chimney, but then remembered, that he had no chimney. He found a couple of pictures that made him think about his future travels and an amazing collage of a beach house on the shore. Medvedik also added a green plant to his bag in order to make his place fresher and more natural. When Medvedik arrived at the counter, he was flabbergasted… He only took couple of things, but what he took looked like a mountain of goods. He must have been carried away by the salmon flow… or lost his concentration for a second. He got everything packed and wrapped, and was exiting the store, when he noticed a promotion sign in the food shop – “Get three cans of herring for the price of two!” … well, that sounded like a good deal to Medvedik. So, he added 12 cans of amazing Swedish smelly herring to his bag and plodded home, contemplating about how on Earth he would hang those pictures on the walls. 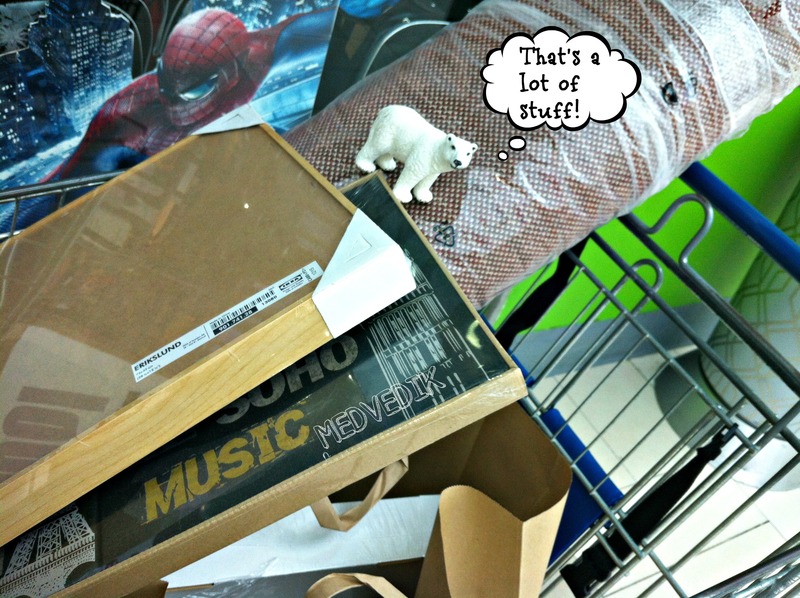 This entry was posted in Flair for Fun and tagged chair, dubai, furniture, herring, Ikea, medvedik, pictures, plant, polar bear, salmon, shopping. Bookmark the permalink. 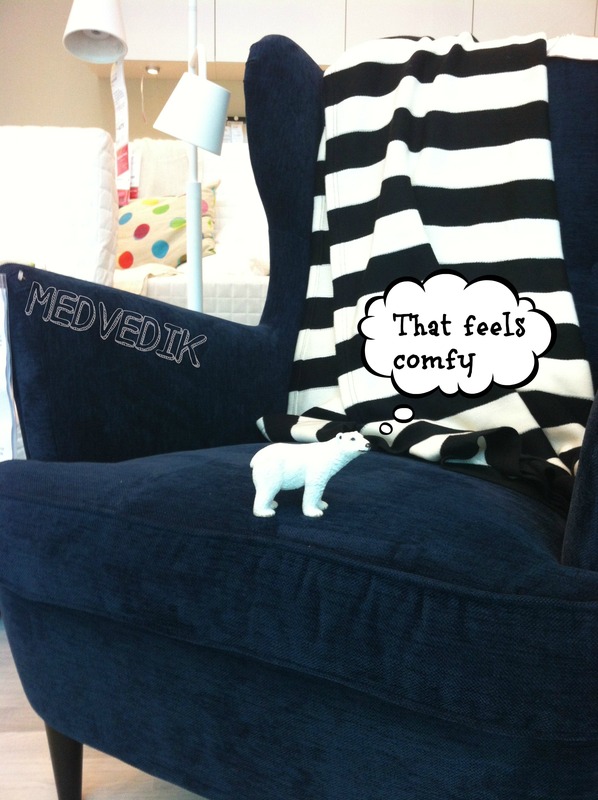 great blog – I love that you carry Medvedik everywhere you go. My daughter has a teddy she loves so much he goes everywhere with us, has done for 4 years now! I suspect one day she too will write about his adventures. Great fun. isn’t ikea having problems with unions right now … i used to love thiem but they seem to be anti-union in a big way! In Russian it is Medved.